The VSSL Supplies flashlight is water resistant, as are all of the VSSL flashlights. It is 9 inches long and 2 inches in diameter (and again, all of the VSSL flashlights fall into these dimensions). It weighs 18 ounces and has two flashlight settings--static and SOS. The flashlight itself is cool enough, but what you get with it is even cooler. 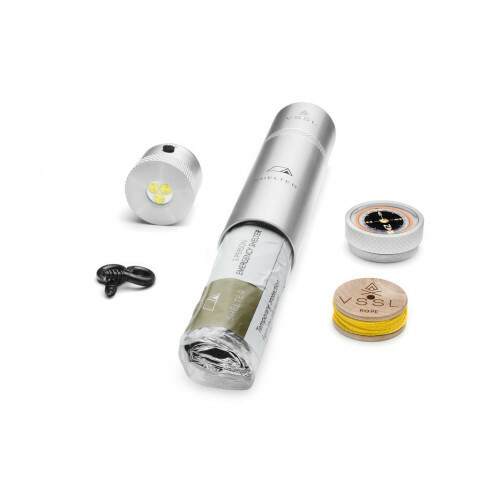 The VSSL Supplies flashlight comes with a compass, which is oil filled, a 4-hour Canadian beeswax candle, a razor blade, 6 Aquatabs water purification tablets, a wire saw (60 pound working strength), emergency whistle, waterproof matches, Tinder Quick fire starters, fishing gear, a signaling mirror, a Marine-grade rope (250 pound breaking strength), reflective trail markers, a can opener, first aid supplies and the VSSL priorities of survival and instructions. Basically, you're getting just about all the supplies you'll need for a camping trip, power outage or Zombie Apocalypse (with the exception of the VSSL Zombie flashlight...see below). You can visit the VSSL site to purchase one, or check out Amazon. 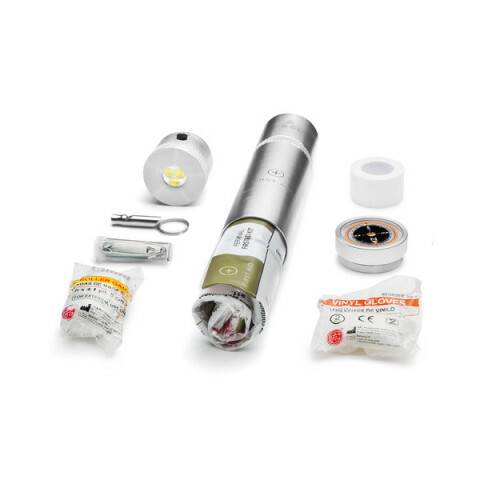 The first aid supplies in the VSSL Supplies flashlight are minimal, but the VSSL First Aid flashlight has a plethora of supplies you could need in an emergency (but hopefully won't need). These supplies are contained in plastic sleeves and could help you save a life or prevent further injury. The supplies in the VSSL First Aid flashlight include antiseptic wipes, tweezers, cleansing wipes, triple antibiotic ointment, cotton pads, a bunch of bandages, ibuprofen, asprin, safety pins, a razor, medical tape, gauze and some gloves. And if you're in an emergency situation, you can always use the emergency whistle or SOS function of the flashlight to signal for help. This flashlight can also be ordered on the VSSL site or Amazon. We've touched on the Supplies and First Aid flashlights from VSSL, but what if you get stranded on a hike, or have any one of a number of "Dual Survival" sort of situations. Then you'll need shelter, and that's where the VSSL Shelter flashlight comes in. These guys at VSSL have an answer for any survival need. Basically this flashlight contains everything needed to set up a temporary shelter. 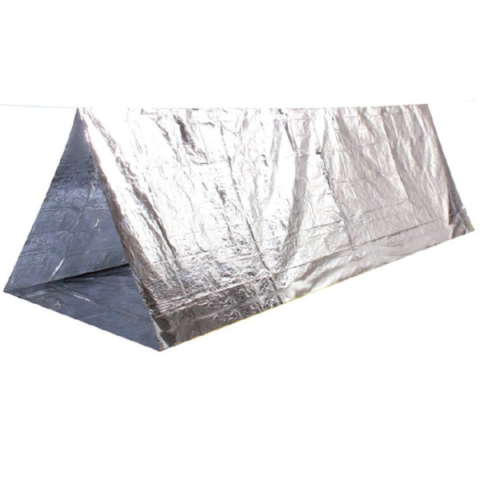 This tent measures 96" x 60" x 36" and reflects 95% of radiated heat. This is ideal for visibility--that means people are more likely to spot you, if you're lost. The tent can also double as a blanket to prevent hypothermia. Of course, the flashlight is also a flashlight that can be used to signal in an emergency, and it contains the standard compass to help you find your way. You can find the VSSL Shelter flashlight on the VSSL site or on Amazon. Perhaps you like the idea of the VSSL flashlights, but you're not a survivalist or someone who lives a life in which you may get yourself into a survival sort of situation. Perhaps you want a cool new gadget to bring along and show off to your friends. Maybe, you think coffee woud be a great thing to put into the empty hull of a VSSL flashlight. If that's the case, grab yourself a VSSL Flask (and again, check out Amazon to get one). 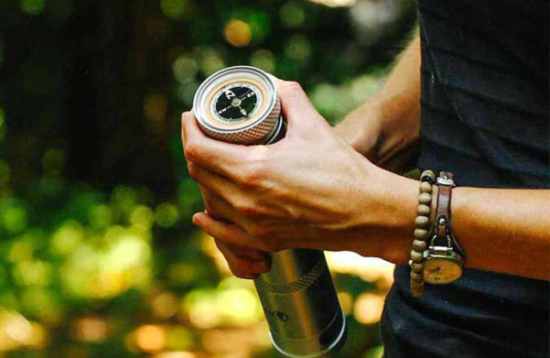 The VSSL Flask comes with the standard compass, and of course, is a flashlight. 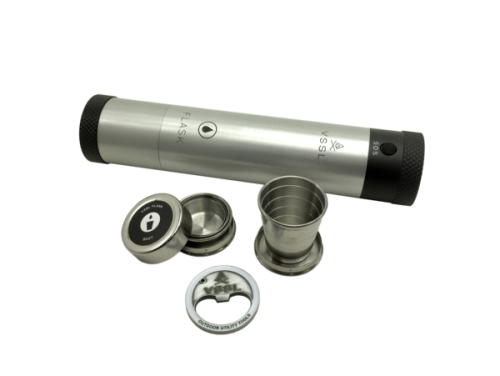 It can hold your favorite beverage (the VSSL site says "favorite booze," but you can put any liquid in the container), and it comes with two stainless steel, collapsable shot glasses, so you can share with a friend. Remember when I mentioned that the VSSL flashlights would come in handy for a Zombie Apocalypse? Well, it seems like the guys at VSSL thought of everything. They have a VSSL flashlight just for such an occasion, the VSSL Zombie. The VSSL team asserts that supplies, first aid and shelter don't matter if you're dead...or undead. That's when you need something more, because "you can't negotiate with the undead." The VSSL Zombie contains, within its hull, a high tensile aluminum spike (not wooden, so no protection from vampires here) and a medical mask to protect you from whatever caused the zombification. You can check out the VSSL site or Amazon to get this cool novelty flashlight. If you're not sure which one of these awesome VSSL flashlights you want, you could always grap the Blank or Empty version. 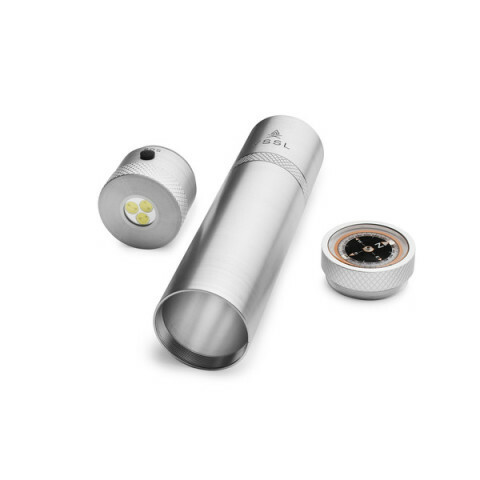 This VSSL flashlight can, as the others are, be found on Amazon or the VSSL site, and you can pick and choose which canisters you want to put in the hull. On the VSSL site, you can also find all of the refills available in the other VSSL flashlights, with the exception of the VSSL Zombie. Fill the Empty canister with whatever you choose. You could actually use the empty hull to fill it with something of your own choosing. 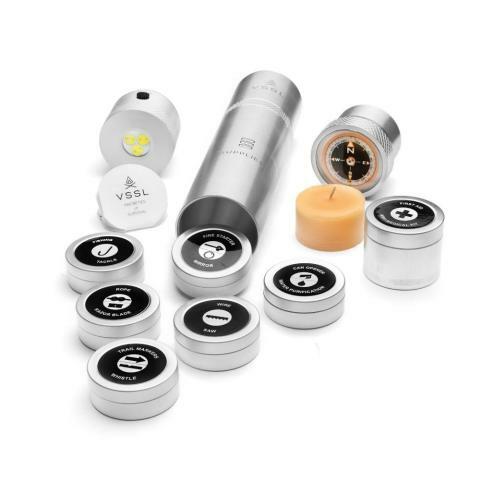 In addition to the refills, you can also get VSSL accessories, including a glass breaker end cap, replacement batteries and gaskets, replacement compasses and lights, VSSL Zombie stickers and more. 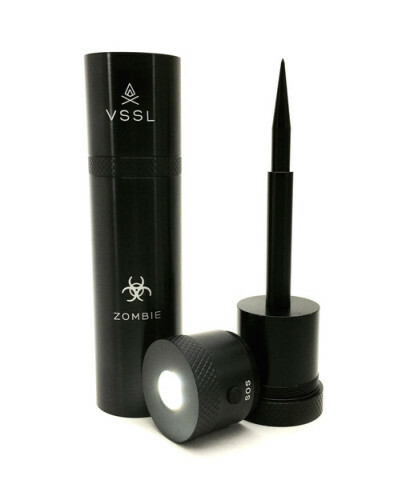 In addition to this article, detailing the awesome VSSL flashlights, I'm giving you a short video plug for the VSSL Zombie. Enjoy.